InterBase was created in 1985: it was the first commercial multi-versioning database. In the end of 1999, Borland decided to close InterBase development and published its source codes under InterBase Public License. This code was copied (it is permitted by the license), and Firebird was born – from the version 1.0 Firebird is a production-ready database, based on previous decades of InterBase development. At the end of 2000, Borland turned back to the closed source and commercial licenses (exactly as it was earlier) with InterBase and started development of 6.5. Firebird 1.0 was released in 2002, with many bugfixes and extensions of DDL and DML. 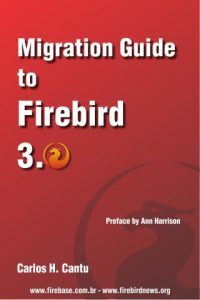 The active Firebird development continued after 1.0, and in 2004 the second major version of Firebird (v.1.5) was released. Borland at that time also has introduced new versions (7.0 and 7.1). Firebird 1.5 and InterBase 7.0 was incompatible both by database format (ODS) and core functionality. The migration from InterBase to Firebird and back with backup/restore is impossible since Firebird 2.0 and InterBase 7.0. Since then, the difference between Firebird and InterBase became bigger. Check the full article from IBSurgeon, and see the currently diferences between Interbase and Firebird. Every year on January 18 we have a small celebration – IBProvider’s birthday. This year it turned 14. We thank all our users for using the provider in your projects. We are pleased to announce the new release of our OLEDB Provider: version 3.18. Now in your projects for Firebird and Interbase you can more comfortable work with Linked Server of MSSQL 2012. Hurrah! We are pleased to announce the release candidate of our .NET Provider for OleDb. Read sets via OleDbDataReader and change them simultaneously (MARS technology). Use nested transactions, savepoints and distributed transactions within the TransactionScope. Execute several select, update and insert queries with parameters(!) within only one command OleDbCommand. Work with absolutely all types of data, including arrays and even Interbase Guid. And yes, now after you have set the command text you don’t need to manually add parameters to the query. Everything is done automatically and on the fly. DA-SOFT Technologies announces the availability of major new version AnyDAC for Delphi Summer 2012 release v 6.0.1 – high-speed, Universal Data Access Components for Firebird, Interbase, SQLite, MySQL, MS SQL Server, Oracle, PostgreSQL, MS Access, IBM DB2, Sybase SQL Anywhere, Informix, Advantage, dbExpress, ODBC, that simplifies the task of building Embarcadero Delphi, C++Builder and Free Pascal Compiler database applications. Do not miss the Summer sale – 25% discount on all AnyDAC orders in August ! AnyDAC for Delphi can be immediately downloaded from the download page. What is new in v6.0.1 and what is AnyDAC ? Native access to Firebird, MySQL, SQL Server, Oracle, PostgreSQL, SQLite, DB2, InterBase, SQL Anywhere, Informix, Advantage Database, DataSnap and more. Including latest DBMS versions. Generic access to any database supported through dbExpress or ODBC data sources. Optimized for best possible performance. 2 times faster than dbGo, 25% faster than dbExpress. Reach API with 50 Delphi VCL components, including TADConnection, TADTransaction, TADQuery, TADStoredProc, TADTable, TADMemTable, TADLocalSQL. Unified API for cross-database access, including unified data type mapping, SQL dialect abstraction, connection aliases. First-class support for many database-specific features, including backup, restore, validation, SQL scripting. Advanced Data Access Options, including Array DML, Live Data Window mode, full Unicode support, Local SQL engine. Delphi 5 to Delphi XE2, C++ Builder 5 to C++ Builder XE2, Lazarus / Free Pascal on Win32, Win64, Linux32, Linux64, Mac OS X, iOS. Perfect integration as back-end driver for DataSnap, TMS AdvGrid, RemObjects Data Abstract, Fast Report, C4D kbmMW and more. Enterprise – Oracle, SQL Server, IBM DB2, Informix. Workgroup – Firebird, Interbase, MySQL, PostgreSQL, SQL Anywhere, Advantage DB. Database in clouds – Microsoft SQL Azure. Desktop – SQLite, MS Access, BlackFish SQL, MS SQL CE, Advantage DB. Embedded – SQLite, Firebird Embedded, MySQL Embedded, Berkeley DB. DA-SOFT Technologies announces the availability of AnyDAC for Delphi Spring 2012 release v 5.0.7.2333 – high-speed, Universal Data Access Components for Firebird, Interbase, SQLite, MySQL, MS SQL Server, Oracle, PostgreSQL, MS Access, IBM DB2, Sybase SQL Anywhere, Informix, Advantage, dbExpress, ODBC, that simplifies the task of building Embarcadero Delphi, C++Builder and Free Pascal Compiler database applications. What is new in v5.0.7 and what is AnyDAC ? Multiple enahncements to the help system. Native access to Firebird, MySQL, SQL Server, Oracle, PostgreSQL, SQLite, DB2, InterBase, SQL Anywhere, Informix, Advantage Database and more. Including latest DBMS versions. Reach API with 50 Delphi VCL components, including TADConnection, TADTransaction, TADQuery, TADStoredProc, TADTable, TADMemTable. Advanced Data Access Options, including Array DML, Live Data Window mode, full Unicode support. Delphi 5 to Delphi XE2, C++ Builder 5 to C++ Builder XE2, Lazarus / Free Pascal on Win32, Win64, Linux32, Linux64, Mac OS X. Perfect integration as back-end driver for TMS AdvGrid, RemObjects Data Abstract, Fast Report, C4D kbmMW and more. DA-SOFT Technologies announces the availability of AnyDAC for Delphi Summer 2011 release v 5.0.1.1845 – high-speed, Universal Data Access Components for Firebird, Interbase, SQLite, MySQL, MS SQL Server, Oracle, PostgreSQL, MS Access, IBM DB2, Sybase SQL Anywhere, Informix, Advantage, DbExpress, ODBC, that simplifies the task of building Embarcadero Delphi, C++Builder and Free Pascal Compiler database applications. What is new in v5.0.1 and what is AnyDAC ? New Advantage Database native ACE API driver (More). New TADTable with live data window mode (More). Major refactoring of the drivers infrastructure. Major refactoring of the monitoring and tracing infrastructure. New ADConnection Before/After StartTransaction, Commit, Rollback events. Multiple enhancements to the help system. Native access to Firebird, InterBase, MySQL, MS SQL Server, Oracle, PostgreSQL, SQLite, DB2 and more. Including latest DBMS versions. Optimized for best possible performance (2 times faster than dbGo, 25% faster than dbExpress). Generic access to any database supported through dbExpress and ODBC data sources. Reach API, including 50 Delphi VCL components. Unified API for access to cross-database features. First-class support for many database-specific features, including DBMS services like backup, validate. Unique ADO.NET-like data engine for Win32. Full support for international applications, including full Unicode support in Delphi 2009 and later. Cross-platform support though Free Pascal (FPC). Enterprise – Oracle, MS SQL Server, IBM DB2, Informix. EMS Database Management Solutions is pleased to announce the new version of SQL Manager for InterBase/Firebird – the powerful tool for InterBase/Firebird database administration and development. EMS SQL Manager for InterBase/Firebird is available and can be downloaded from the download page. What’s new in SQL Manager for InterBase/Firebird 5.2? Preliminary support of InterBase 2009. Support of Embedded User Authentication (EUA) for InterBase 7.5 and higher. For Firebird 2.5 it is now possible to create a view from a stored procedure. Changed the method of accumulating a script to compile changes made in the editor. Added the possibility to select the editor type (modal or individual) which is opened by double-clicking the trigger. Added the possibility to use Explicit Cursors for Firebird 2.x. Added the possibility to auto-fill cursors. It is now possible to use Common Table Expressions (CTE) for Firebird 2.1 and higher. Added the possibility to auto-fill cursors for the Execute Block statement. Added the support of procedures with Explicit Cursors. Other minor improvements and bug-fixes (read the full list).